Earlier this year my DS, complete with case and games, was stolen. Until recently I held out some small hope in the back of my mind that I might recover it and that all the hours invested wouldn't have been in vain. Now I know I will never see it again. The DS itself being stolen wasn't the loss that I grieved most. Among the games stolen were both of my Pokemon cartridges. More hours than I care to openly admit were invested and reflected in an impressive collection of Pokemon. I'm afraid that when I made the theft report I must have sounded like a kook to the officer. "I just can't lose all that time! ", I said trying to impress upon him the importance of my DS's recovery. Realizing now that my DS is gone forever has left me lost. I have no idea how to begin again with my Pokemon (Gotta Replace 'em All!) I feel haunted by the ghosts of these virtual creatures in who's company I spent so much time. This most recent loss made me think back on my history with Nintendo's handheld devices. 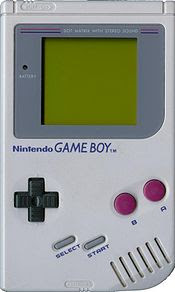 I got my first GameBoy in 1991. It was second hand, a techno-toy that my uncle had gotten for himself. It was gifted to my sister and I, and became the center of many an argument about "sharing". Her interest eventually dwindled and the GameBoy became mine entirely. My game cartridge collection started with a few hand-me-down games that friends had lost interest in. I enjoyed them all. I spent hours of my childhood with this tiny gray box. Darkwing Duck, Alien3, Tetris, Home Alone, GB Basketball, Link's Awakening, these were only a few of the cartridge companions during my formative years. I built an impressive collection of games and I had a slick black case in which to keep all of my GameBoy paraphernalia. I had the GameBoy Battery Pack, Screen Magnifier (with night light! ), and GameGenie. I could game anytime and anyplace. I was devastated when I lost this collection on a bus in southern Georgia in '97. By some luck I carried my GameBoy separately along with it's battery and a few choice games. Grieving for my lost collection I dove headfirst into the Pokemon craze. Unfortunately my Poke-progress would be stalled on Christmas Day of 1999. My GameBoy had seen very heavy use over the years and it was the worse for wear. The battery pack's cord was shorted in many places and I had it tied in knots further secured with duct tape to ensure the power's flow. At one point near the end of it's life I could only get it working if I held it at a 60 degree angle. On Christmas when I got my long awaited Pokemon Yellow cartridge I fired up my GameBoy immediately. The screen flickered, it let out a pitiful whine, and died. I desperately missed my GameBoy. Though the new GameBoy Color was all the rage among my peers I had held fast to my gray brick. It was a badge of honor that I had nursed my poor GameBoy for so long. I felt as if a beloved family pet had died. While I did receive a GB Color as a birthday gift later it seemed like a shadow of the one I had before. I knew every nook and cranny of my old one and this new device's weight felt wrong in my hands. For all it's "color" it seemed devoid of personality and to play it felt almost like a betrayal. I withdrew a bit from gaming culture shortly after that. I tried for years to conform more to the non-gaming community's norms, looking for some kind of acceptance. I spent most of my young adult years treating gaming as some thing that I used to do (though I secretly missed it desperately). When my husband and I were dating (he introduced me to gaming again) he got me a Nintendo DS. I dared to love, I mean game, a second time and my DS became another dear companion. Now I have to cope with this loss again. I am sure a psychologist would have a field day with my obvious attachment to these items but I do miss my pocket friends. I will get over this loss as I have in the past and move on. I will get another handheld and play again, but next time I will chain the damn thing to my wrist.